Montgomery to Lead Dallas Stars - College Hockey, Inc.
NCAA champion as a player and coach becomes head coach in Dallas. Jim Montgomery led Denver to the NCAA Tournament in each of his five seasons as head coach (Photo by Larry Radloff). 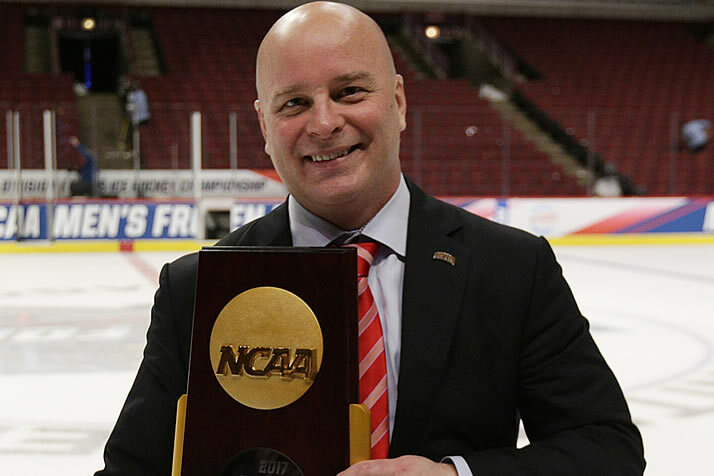 Jim Montgomery, who won NCAA championships as a player at Maine in 1993 and as a head coach at Denver in 2017, was named the head coach of the NHL’s Dallas Stars on Friday. Montgomery becomes just the fifth NHL head coach hired directly from the college ranks and joins Philadelphia’s Dave Hakstol as the second of those in the last four years. Montgomery joins Hakstol, Detroit’s Jeff Blashill and New Jersey’s John Hynes as one of four current NHL head coaches who have NCAA experience. Nine current NHL head coaches played college hockey (Carolina and the New York Rangers currently have coaching vacancies). Montgomery spent five years as the head coach at Denver, reaching the NCAA Tournament each season and winning the 2017 NCAA title. The national coach of the year in 2017, he began his coaching career at Notre Dame and Rensselaer, and won two Clark Cup championships with the USHL’s Dubuque Fighting Saints. Montgomery was the NCAA Tournament Most Outstanding Player in 1993 when he helped lead Maine to a 42-1-2 record and the national championship. The Montreal native played 122 games in the NHL during his professional career.